This webpage will discuss the types of fabric that you will need. Any fabric can, in theory be hand quilted, but the most popular choice is the type of medium-weight cotton fabric generally used for craft work. Amish Baskets uses plain coloured medium-weight cotton fabrics. 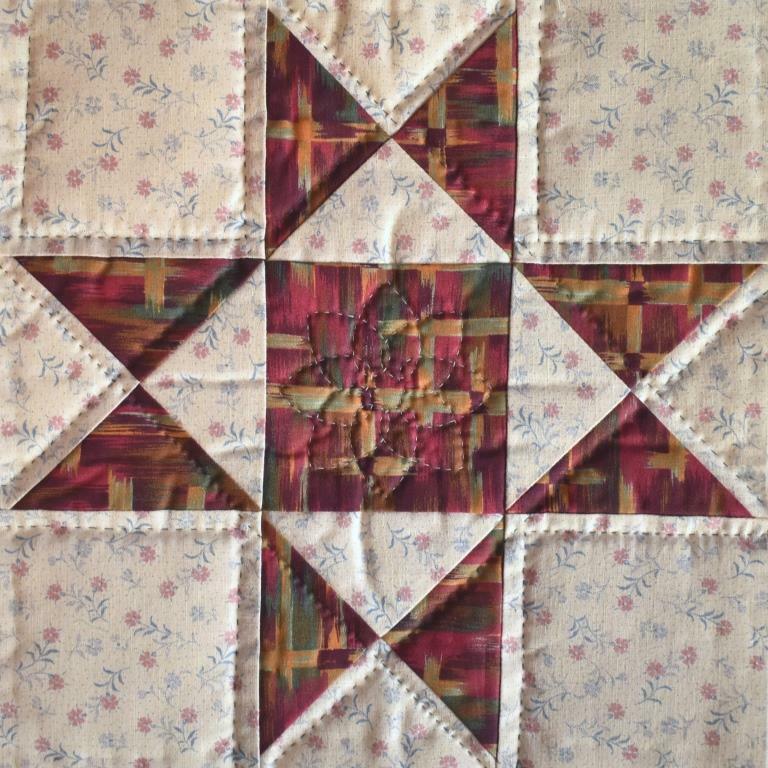 Any of the cotton fabrics that you use for patchwork should be suitable for hand quilting, but you will struggle if it is tightly woven (such as batiks) or too heavy (e.g. furnishing fabrics), so it is a good idea to test if it will “needle” easily. “Needling” fabric to test its suitability. 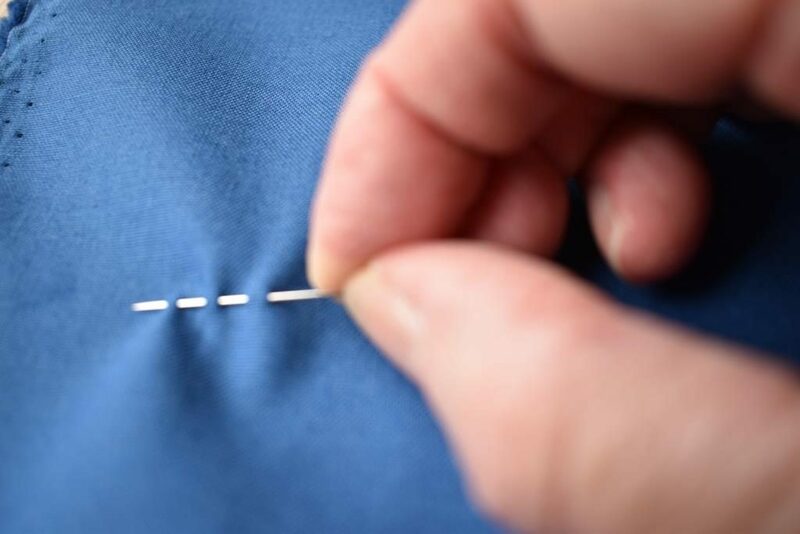 Just “stitch” in and out several times with an unthreaded needle, and then pull it through. If this felt stiff and difficult just with the top fabric, then it’s going to be worse with the wadding and backing as well – so choose something more suitable. Don’t forget to test your proposed backing fabric too – purchased sheets for example are often a very tight weave, so are not really suitable for hand quilting. Avoid anything too loosely woven either – your stitches can disappear between the threads. Highly patterned fabrics will not show up the quilting stitches very well – compare how the stitching shows up on the two fabrics in the block below. For your very first attempt, this can be an advantage, as you will not be tempted to keep unpicking it if it looks uneven! However, once you are starting to feel more confident, plain or semi-plain fabrics are a better choice, as they will show up your quilting nicely. So, if you have already made a patchwork top with the usual quality of cotton fabrics, you could choose to hand quilt it. Something simple like Ohio Star is ideal. Outline quilting the pieces ¼ ” away from the seam lines is a good place to start. 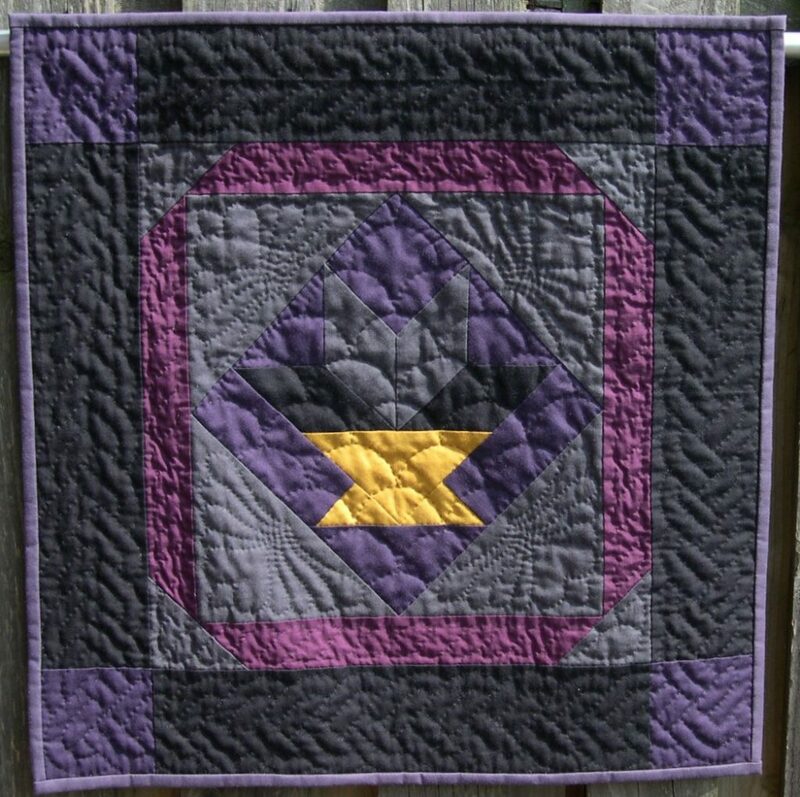 Choose which parts you want to stand up most – and outline quilt on the other fabric to squash it down in comparison. 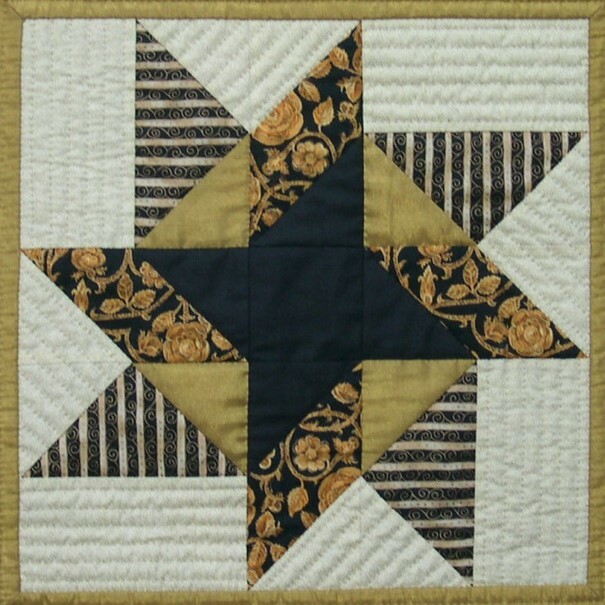 I would not recommend hand quilting anything that is made up of a very large number of small pieces, such as complicated foundation piecing, as there are too many seams to stitch through – and to be honest, there will be enough interest in the patchwork to make elaborate quilting a distraction. 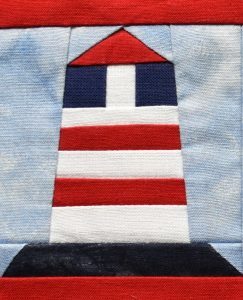 This little lighthouse is less than 3″ square – and I certainly wouldn’t try hand quilting it. A project where you don’t need to stitch across many seams is easiest. 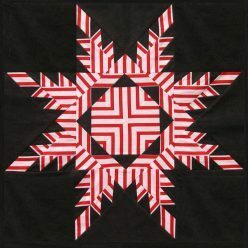 I chose to quilt simple parallel lines in the background of this Catherine Wheel. The direction of the lines enhances the swirling feel of the design. 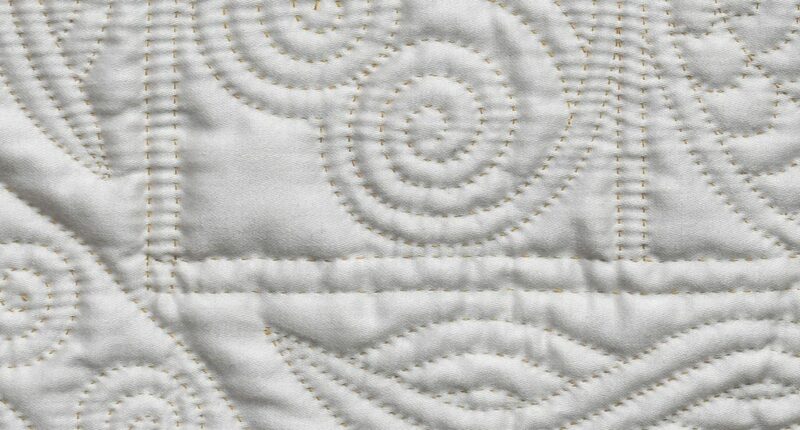 Designs such as Irish Chain are ideal for hand quilting, as a motif can be chosen which fills the large, blank areas. 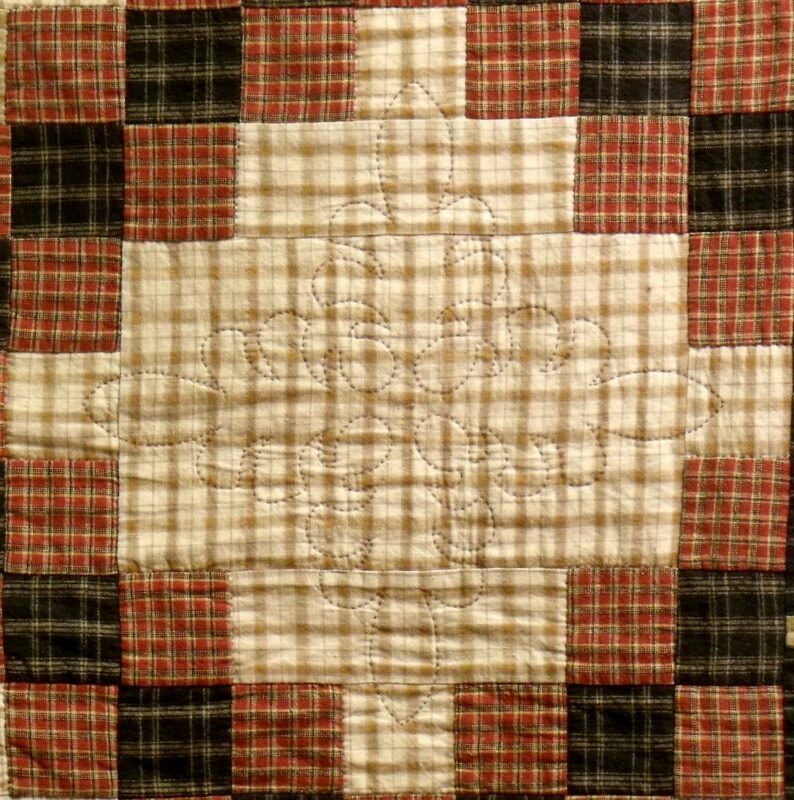 I used plaids for this quilt, but chose a low contrast pale fabric so that the quilting motif could be seen. 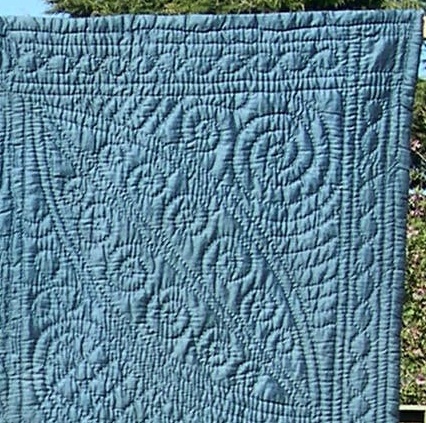 A wholecloth quilt is one which has no patchwork, but where all the design interest lies is in the quilting. 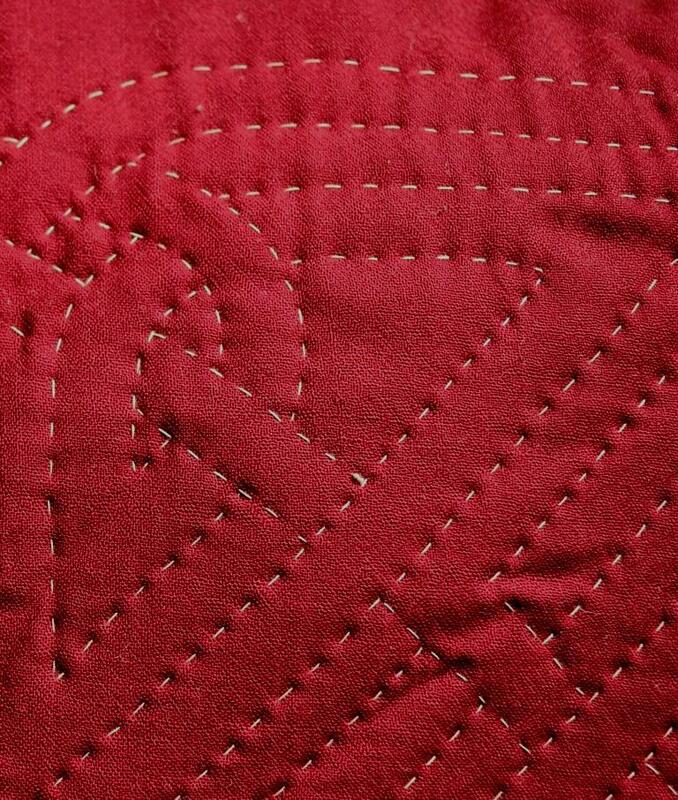 Plain fabric shows the quilting up best. These are beautiful, and a wonderful choice once you have mastered an even quilting stitch. 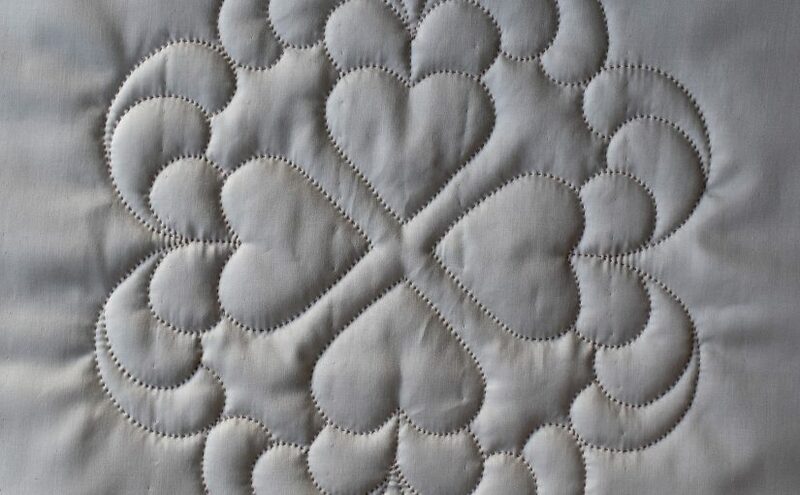 Fabrics with a slight sheen to them, such as cotton sateen, have been particularly popular for wholecloth quilts for over a hundred years, as they catch the light, and show up the texture of the quilted surface beautifully. Have a look at some of my lovely antique wholecloth quilts for inspiration. 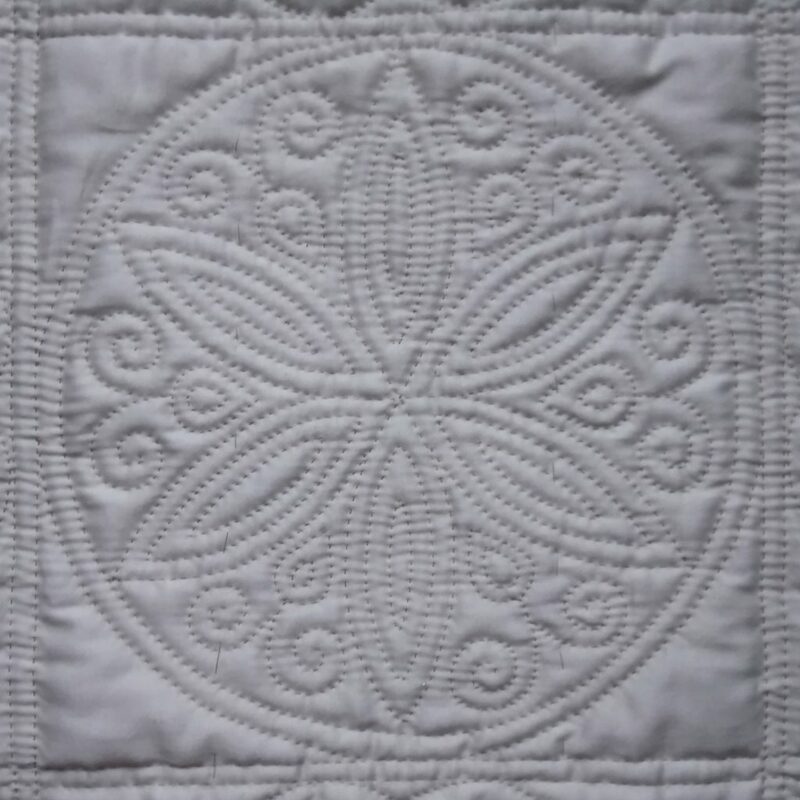 However, it is worth planning your quilting on cotton sateen to avoid stitching along the straight grain parallel to the long floating threads. The stitching tends to sink down and be lost – look at the difference between the horizontal and vertical stitches here. No matter how hard I tried, I could not get it to look as even. Cross grain or diagonal stitching is unaffected by the satin weave. Fabrics other than cotton can be successfully used. Amy Emms, who kept the tradition of North Country quilting going through the mid twentieth century, had a particular fondness for polyester satin, as seen if you click on this link to a tea cosy in the Quilters Guild Collection. I used a burgundy wool fabric for this hand quilted cushion.